Credit: Mamadou Faye/courtesy Wassila Thiaw, NOAA CPC. The Sahara Desert has expanded by about 10 percent since 1920, according to a new study by University of Maryland scientists. The research is the first to assess century-scale changes to the boundaries of the world's largest desert and suggests that other deserts could be expanding as well. The study was published online March 29, 2018, in the Journal of Climate. Deserts are typically defined by low average annual rainfall–usually 100 millimeters (less than 4 inches) of rain per year or less. The researchers analyzed rainfall data recorded throughout Africa from 1920 to 2013 and found that the Sahara, which occupies much of the northern part of the continent, expanded by 10 percent during this period when looking at annual trends. When the authors looked at seasonal trends over the same time period, the most notable expansion of the Sahara occurred in summer, resulting in a nearly 16 percent increase in the desert's average seasonal area over the 93-year span covered by the study. "Our results are specific to the Sahara, but they likely have implications for the world's other deserts," said Sumant Nigam, a professor of atmospheric and oceanic science at UMD and the senior author of the study. Nigam also has a joint appointment in UMD's Earth System Science Interdisciplinary Center (ESSIC). The study results suggest that human-caused climate change, as well as natural climate cycles such as the Atlantic Multidecadal Oscillation (AMO), caused the desert's expansion. The geographical pattern of expansion varied from season to season, with the most notable differences occurring along the Sahara's northern and southern boundaries. "Deserts generally form in the subtropics because of the Hadley circulation, through which air rises at the equator and descends in the subtropics," Nigam said. "Climate change is likely to widen the Hadley circulation, causing northward advance of the subtropical deserts. The southward creep of the Sahara however suggests that additional mechanisms are at work as well, including climate cycles such as the AMO." The Sahara is the world's largest warm-weather desert, roughly equal in size to the contiguous United States. (The Arctic basin and the Antarctic continent–which are each about twice as large as the Sahara–also qualify as deserts due to their low rates of precipitation.) Like all deserts, the boundaries of the Sahara fluctuate with the seasons, expanding in the dry winter and contracting during the wetter summer. The southern border of the Sahara adjoins the Sahel, the semi-arid transition zone that lies between the Sahara and the fertile savannas further south. The Sahara expands as the Sahel retreats, disrupting the region's fragile grassland ecosystems and human societies. Lake Chad, which sits in the center of this climatologically conflicted transition zone, serves as a bellwether for changing conditions in the Sahel. "The Chad Basin falls in the region where the Sahara has crept southward. And the lake is drying out," Nigam explained. "It's a very visible footprint of reduced rainfall not just locally, but across the whole region. It's an integrator of declining water arrivals in the expansive Chad Basin." 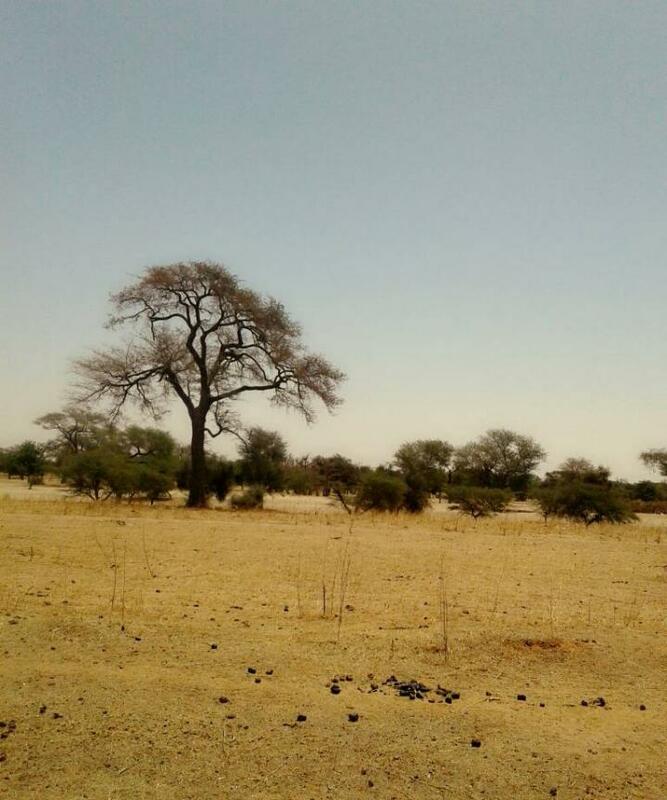 A number of well-known climate cycles can affect rainfall in the Sahara and the Sahel. The AMO, in which temperatures over a large swath of the northern Atlantic Ocean fluctuate between warm and cold phases on a 50- to 70-year cycle, is one example. Warm phases of the AMO are linked to increased rainfall in the Sahel, while the opposite is true for the cold phase. For example, the notable drying of the Sahel from the 1950s to the 1980s has been attributed to one such cold phase. The Pacific Decadal Oscillation (PDO), marked by temperature fluctuations in the northern Pacific Ocean on a scale of 40 to 60 years, also plays a role. To single out the effects of human-caused climate change, the researchers used statistical methods to remove the effects of the AMO and PDO on rainfall variability during the period from 1920 to 2013. The researchers concluded that these natural climate cycles accounted for about two-thirds of the total observed expansion of the Sahara. The remaining one-third can be attributed to climate change, but the authors note that longer climate records that extend across several climate cycles are needed to reach more definitive conclusions. "Many previous studies have documented trends in rainfall in the Sahara and Sahel. But our paper is unique, in that we use these trends to infer changes in the desert expanse on the century timescale," said Natalie Thomas, a graduate student in atmospheric and oceanic science at UMD and lead author of the research paper. The study's results have far-reaching implications for the future of the Sahara, as well as other subtropical deserts around the world. As the world's population continues to grow, a reduction in arable land with adequate rainfall to support crops could have devastating consequences. "The trends in Africa of hot summers getting hotter and rainy seasons drying out are linked with factors that include increasing greenhouse gases and aerosols in the atmosphere," said Ming Cai, a program director in the National Science Foundation's Division of Atmospheric and Geospace Sciences, which funded the research. "These trends also have a devastating effect on the lives of African people, who depend on agriculture-based economies." Thomas and Nigam are focused on learning more about the drivers behind desert expansion in the Sahara and beyond. "With this study, our priority was to document the long-term trends in rainfall and temperature in the Sahara. Our next step will be to look at what is driving these trends, for the Sahara and elsewhere," Thomas explained. "We have already started looking at seasonal temperature trends over North America, for example. Here, winters are getting warmer but summers are about the same. In Africa, it's the opposite–winters are holding steady but summers are getting warmer. So the stresses in Africa are already more severe." The research paper, "20th-Century Climate Change over Africa: Seasonal Hydroclimate Trends and Sahara Desert Expansion," Natalie Thomas and Sumant Nigam, was published online March 29, 2018, in the Journal of Climate. This work was supported by the U.S. Department of Defense's National Defense Science & Engineering Graduate Fellowship Program and the U.S. National Science Foundation (Award No. AGS 1439940). The content of this article does not necessarily reflect the views of these organizations.